The penultimate GB9 event of 2018 was upon us, and some of the finest pool players in the UK and Europe made their way to Telford for the UK Open. With Mosconi Cup ranking points up for grabs, as well as a guaranteed £10,000 prize fund, everything was to play for. Early shocks were in abundance, with the open draw format meaning some big hitters battling it out early on. Benji Buckley edged out Tim De Ruyter, over from the Netherlands for his first GB9 event, with a tense 9-8 result. Wojciech Szewczyk brought his unique brand of cool and calm to dispatch Yorkshire legend Darren Appleton. Appleton wasn’t at the top of his game after a difficult schedule over the last 12 months, but Szewczyk was ruthless in his performance. Northern Masters Challenge 2 winner Stephen Slater also showed his bottle dispatching debutant Ali Asgar Merchant in a final rack decider and James Jack, fresh from some recent high profile English 8-ball wins, took the biggest scalp in his 9 ball career with victory over Dave Nelson. Rising star Lee Creighton and experienced cueist Alan Coton were quietly going about their business, with wins over Damian Massey and Kev Simpson for Creighton, and Neil Margossian and Filip Krawczyk for Coton. Creighton and Coton would end up on opposite sides in the quarter-final, a new achievement for the former at a GB9 Main Event, and the match was a cracker. With Coton winning the battle of break and runs, he managed to get to the hill first, but a missed opportunity at 8-7 and a tough miss to the middle bag at 8-8, Creighton cleared nicely under pressure to move through to the semi-final. Meeting Lee in the semi-final was an ever present Mark Gray. After his victory at the Northern Masters, Gray was one of the fancied favourites to win his first U.K. Open title. Gray had tough match after tough match on his route through the draw, but picked off Shane O’Hara (9-3), Benji Buckley (9-6) and Michael Beeston (9-5) to make the Last 16 stage. He was again faced with Benji Buckley, and again the result was a win, only this time Gray upped his game to take the match 9-2. Stewart Colclough met the same fate as those before in the quarter-final, again Mark breezing to a 9-2 win. In the other half of the draw, Imran Majid was at his methodical best, coming through the winners bracket with wins over Can Ibrahim (9-0), Kev Simpson (9-8) and Kurtis Weaver (9-3). Imran needed a solid performance to progress past an ever improving Tom Staveley (9-6), and then again to end Tim De Ruyter’s fine run through the losers bracket 9-6, leaving only Wojciech Szewczyk bearing the flag for Europe in the business end of the tournament. Szewczyk, who also qualified through the winners bracket, had already had victories over Appleton, Adam Collins (9-1) and Lee Creighton (9-6) to make the Last 16. He then faced off against Arfan Dad, playing his first GB9 event for a number of years. 2 break runs and more methodical play gave Szewczyk a 9-4 win and he only conceded two more than that over GB9 Dave Evans, who had battled all the way through the losers side after a first round defeat to former World Champion Daryl Peach. The two semi-finals couldn’t have been more contrasting. Gray priced too strong for Creighton, who will be disappointed with his display in the match, and ran away a 9-3 victor. Majid and Szewczyk, however, proved to be an absolute classic, with the latter battling back from 8-6 behind to snap off the final 3 racks (two against the break) to make his maiden final. In the final, Gray raced to a solid lead and was left holding on towards the end of the match, with Szewczyk once again showing tonnes of grit and determination. In an even longer race Szewczyk might have fancied his chances of coming back to take victory, however Gray showed why he is known as the ‘granite’, holding off the late Szewczyk charge and pouncing on a mistake on the 3 to take the victory, and his first U.K. Open Title 11 racks to 9. Challenge 1 was once again bursting at the seams with talent, and there were no easy draws. Andy Yates had a great start in his maiden Challenge 1 event, showing he’s capable of mixing it with the big boys when not donning his white gloves – shunting a slightly off-form Barry French to the loser’s side 9-8. So Shaw out-strutted ‘Pidgeon’ Chris Patient, and with neither player liking to hang around it was a quick fire match. Tom Staveley continued his good form and it took a defeat against eventual winner Kurtis Weaver to send him home. Neither player at their best in the later racks, but the rolls tipped slightly in Kurtis’s favour, helped no doubt by some cracking long-range potting. 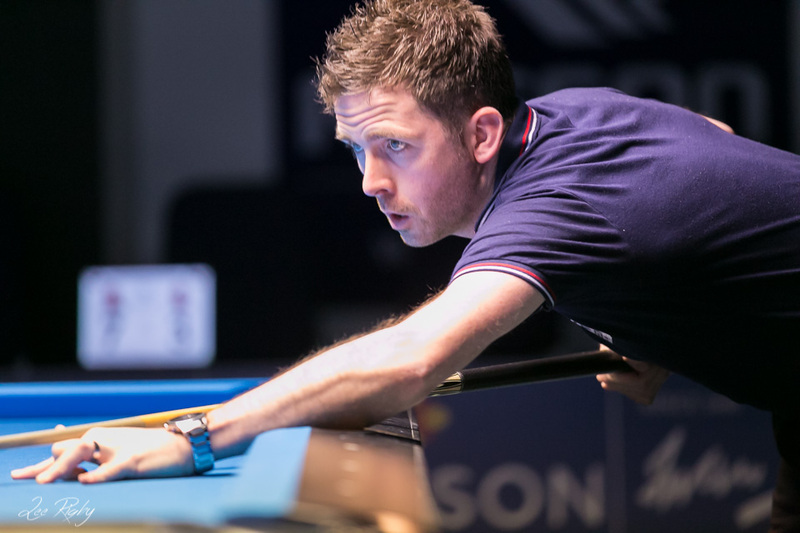 The frustrations of 9-ball were showing elsewhere – ex World Champion Daryl Peach was struggling against in-form Kev Simpson, which led him to throw in the white towel. And returning Arfan Dad had a good run – a notable win coming from behind against Elliott Sanderson, before falling to Benji Buckley in the quarters. The afore-mentioned Weaver however, had fallen into a groove by this point and capitalised on some uncharacteristic mistakes from Buckley, taking the final 9-5. Well done Kurtis! With the quality-gap between the two tiers narrowing each year, the line between the two divisions becomes ever more blurred. With Paul Taylor and Dave Hopkin trading places, on paper there was a favourite in place for the event. However, pool isn’t played on paper (it’s played on Tournament Blue Andy Billiard Cloth) and newbie Ayoub Bakhtaoui had other ideas. In an interesting twist of fate, Hopkin and Bakhtaoui faced off early on in the winners qualifier round, and Hopkin got the better of the duel. Ayoub went on to make his way past Ryan Coton, Can Ibrahim and Rikki Hatherley, while Hopkin took down Filip Krawczyk, Ali Asgar Merchant, and Laszlo Zsom along the way. Elsewhere Julian Roper battled his way to yet another decent run, bowing out to a free-flowing Daryl Garland, who was made to stutter as the game went on. Dave Wyatt also had a strong run, taking down Kevin Rowles and Lee Watt, and succumbing only to John Chapman in a hill-hill decider. In the final, Hopkin and Bakhtaoui went at it again, and this time, Bakhtaoui went into an early lead. Hopkin struggled to find his groove despite coming in off the back of a strong 9-2 win, and it was the Moroccan that closed the match out, and the tournament, in his debut event. Congratulations Ayoub!